Don’t let a sluggish metabolism slow you down or hamper your results. Some simple tweaks can help you burn more calories and maximize your efforts. Read on for some of our favorite research-proven strategies. Your metabolic rate (how fast you burn calories) naturally slows when you’re resting or sleeping and spikes when you’re up and about, especially during your workouts, notes Michele Olson, Ph.D., a principal researcher at the Auburn University Montgomery Scharff-Olson Kinesiology Laboratory, who has studied metabolism at length. But don’t count on your workout alone to keep your metabolism humming on high. If you’re seated at a desk for most of the day, your burn rate can slip into slow-mo. "A desk job is the metabolic equivalent of sleeping all day," Olson says. The more you get up and move about, the more calories you'll expend and the higher your metabolic rate. Try taking walking breaks every hour or do 20 jumping jacks every 20 minutes. (Close your office door if you're lucky to have one or use the stairwell in your building.) Or download StandApp (iTunes), a 99-cent app that not only reminds you to get up at least every hour but also provides 30 office-friendly exercises you can do right at your desk. To take it to the next level, invest in a standing desk such as the UpDesk CrankUp ($99, myupdesk.com) or the VariDesk Pro ($300, varidesk.com)—you burn about 28% more calories working while you’re standing than when seated. Cutting too many calories from your diet can screw up your body's ability to burn fat more efficiently. That's because your brain actually uses your satiety and fullness cues to turn your white blubbery fat into metabolically active brown fat, according to a recent study on mice in the journal Cell. When you're hungry, your brain tells your body to hold on to its white fat cells as a protection against cold and ­famine. In general, don't allow your calories to fall below 1,200, but that number can vary depending on your size and activity. Calculate your basal metabolic rate (the number of calories your body needs to survive) at bmrcalculator.org. Tabata intervals typically consist of 20 seconds of an intense exercise (such as squat jumps) followed by a 10-second break, repeated eight times through. This supramaximal anaerobic training method burns about 13.5 calories per minute, according to research done by Olson, plus it doubles your metabolic rate for 30 minutes afterward. The key is to find an activity that uses a large percentage of your muscle groups, such as your back, chest, glutes, and legs. Think burpees, squats, or mountain climbers, or try cardio faves such as swimming, cycling bursts, or running sprints. The macronutrient does more than just play a role in building muscle. It also helps keep you full by suppressing ghrelin (the hunger hormone) while optimizing leptin (the satiety hormone) and insulin, says nutritionist JJ Virgin, author of The Sugar Impact Diet. Plus, the very process of digesting protein gives your body a little metabolic boost, because your body has to expend more calories to break it down than it would digesting carbs or fat. Aim for four to six ounces of quality protein at every meal, such as grass-fed beef, poultry, fish, eggs, legumes, or nuts. Cayenne peppers, a spice rack mainstay, is also a metabolism booster. "The capsaicinoids from pepper extracts increase thermogenic energy expenditure, increase fat oxidation, and reduce appetite," explains Victor R. Prisk, M.D., an orthopedic surgeon and member of the GNC Medical Advisory Board. Researchers also speculate that the spices help activate brown fat, speeding up metabolism, according to a 2014 scientific review published in the journal Progress in Drug Research. In addition to Tabata, other high-intensity interval training (HIIT) routines can also help significantly increase your burn rate. "HIIT is a great metabolism booster because it can be done in short sessions but gives a long-term burn," Prisk notes. That's because your body has to work harder both during the exercise and also to recover back to its resting state. The more intense the exercise, the more your body needs to recover, which translates to more calories burned after you stop, he adds. Don't let chilly spring temps keep you from your favorite run—the cold can actually work for you when it comes to boosting metabolism. "Exercising in the cold burns more calories, especially if you're shivering, which increases the metabolic rate," Olson says. In addition, cold temperatures initiate an immune response in the body that makes it convert your white, cellulite-like fat into more metabolically active brown fat, according to research from the University of California at San Francisco. We know you're already doing this, but keep it up. "Muscle is metabolic currency, and building muscle helps boost your metabolism," Prisk says. Consider this: If you increase your muscle mass by 20%, you'll increase your resting metabolic rate by 4–5%. That’s approximately an additional 65 calories a day (based on a 30-year-old woman who weighs 135 pounds and is 5'4"). One way to make sure you're adding more lean muscle is to play around with your exercise schedule, notes Prisk. "Studies suggest that the order of your cardio and weights can make a difference in how much muscle you retain from your training." While muscle growth ­adaptations are often best retained when you follow cardio with weight training, it’s not a hard-and-fast rule. "If you plan to lift heavy, then it doesn't make sense to pre-exhaust yourself with cardio first," he adds. "I suggest changing it up. Try mixing cardio into circuits one day and increasing your weight-training pace to bump up your heart rate on your next session." And don't be afraid to pick up a bigger weight off the rack. In general, lighter weights may help increase muscular endurance, but they don't do much to stimulate muscle growth. 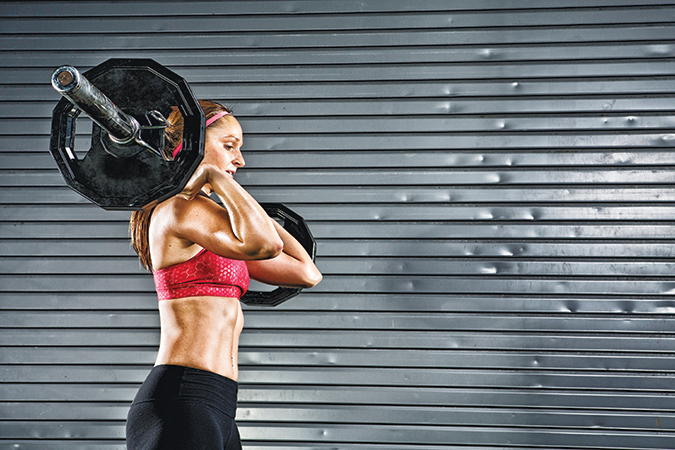 The best way to do that is to lift loads that exhaust your muscles during the final few reps. Your body primarily gets its energy to function from two main fuel sources: glucose and body fat. It goes through glucose first, since that's a quick and easy energy source. It keeps burning some level of carbs but then also turns to fat stores for fuel. But when you eat too much sugar, your systems start to go haywire, says Virgin. "Your body begins to rely on a steady supply of sugar for energy," she notes. "It starts to crave more and more sugar as a primary source of fuel and becomes less reliant on fat stores." Ultimately, she adds, this works to slow your overall metabolism. Journal of Clinical Investigations, when we disrupt our circadian rhythms, either with jet lag or a lack of sleep, our bodies experience a disruption in our metabolic processes on both a hormonal and cellular level. To make sure that you’re getting the right quantity and quality of sleep, check out the Sleep Cycle app (99 cents, for iOS and Android; sleepcycle.com) or SleepBot (free, iOS and Android; mysleepbot.com).